This book gives all the 1943 Roots in correct Panini order with Accents (Anudata, Udata and Svarita), preserving the Dhatu Serial Number so that looking up a dhatu in another dhatupatha becomes easy. Relevant Ashtadhyayi Sutra is given in many places. This book is a standard size edition. 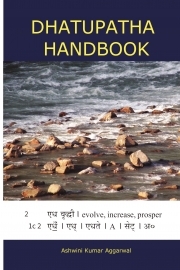 Immensely useful for graduate and post graduate students of Vyakarana or Vedanta. He loves to practise Yoga, perform Homa, study Sanskrit and be at home.